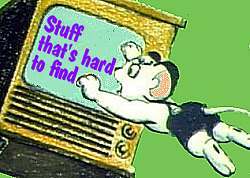 A collection of Kimba video files. Here are some video files I'm really happy to share. The links on the left are in RealVideo to keep them small enough for easy downloading, so you'll need the Real Player to play any of these files. If you don't already have the Real Player, it's free: Real.com But make sure you're clicking on the free player and not the $30 player. Here is what everybody remembers, the opening sequence and theme of our beloved show, Kimba The White Lion. This clip is a new restoration of the original. Be prepared to have the song stuck in your head for days! Here is the same video clip in Windows Media format. 1.3MB. Here is the alternate version of the 1966 Kimba theme. This clip is also a new restoration of the original, only available in YouTube format (at the right). Back in 1966 they also made a Spanish version of Kimba. Here is that theme, also in a new restoration of the original, and also only available in YouTube format (at the right). Yes, they left the title "Kimba The White Lion" in English even on the Spanish shows. This is the rarest Kimba clip of all! This clip shows the big scene from the first episode, when Kimba's mother appears to him in the stars. This "lost" version is a different performance by the people that did the famous American dub. It has more beauty and power than what's been available. The whole episode has now been found; full info is at White Lion Restorations. Here is the opening sequence and theme of the Japanese TV series of Kimba ("Jungle Emperor"). This is available on the "Extras" disc in the Kimba Ultra Edition DVD set. One of my favorite songs, Kitty's theme as sung by Kitty herself, in the original Japanese. This is from Episode 34, Jungle Fun. RealVideo 5 format; 863 kilobytes. Here is the same video clip in Windows Media format. 742 Kbytes. The imagery used in Kimba can be very powerful-- it's often very dreamlike, making me feel like it's reaching something deep within my brain. This song has never been shown outside of Japan -- not even in the re-dubbed 1993 version of the show. (But you can get it on the "Extras" disc in the Kimba Ultra Edition DVD set.) It's from the episode "The Pretenders", and it happens right after Cassius whistles for his almost-supernatural henchmen, the four black panthers. Now, if this doesn't reach in and grab the dream imagery section of your brain, I don't know what will! Here's another missing musical moment, not heard in any English-language version of the show: a song Kimba sings to the memory of his father as he looks for strength and courage to face the insect invasion. Here is a montage of the pictures from our episode guide to Kimba the White Lion. The music is the alternate (rare) version of the American theme song. This is a YouTube clip (at the right). Here is the birth of Kimba's and Kitty's cubs from the series which Osamu Tezuka wrote as a sequel to Kimba, showing Kimba and Kitty as adults. It came over here in the 80s as "Leo the Lion", and everyone in it had their original Japanese names, so Kimba is called Leo and Kitty is called Lya. This is from episode 5, "Leo Becomes a Father". Another scene deleted from most American "Leo the Lion" videos (but available on the UNCUT Leo the Lion DVDs), here Leo (Kimba) introduces his peaceful kingdom to an incredulous human. RealVideo G2 format; 853 kilobytes. Here is the same video clip in Windows Media format. 858 Kbytes. Here is a montage of the pictures from our episode guide to Leo the Lion. The music begins with one of the American themes for Leo the Lion, and shifts to the song from "Lily, the Black Leopard" (episode 16). This is a YouTube clip (at the right). This one is the title sequence from 1997's Jungle Emperor Leo movie. Take some elements from the Jungle Emperor opening and the birth of Kimba's cubs, add a decent budget, throw in a few tweaks at Disney, and this is what you get. This is really beautiful. This page updated 4 February 2009.